Robert Clare’s life story is one of rags to riches. He came from a poor family in Runcorn, Merseyside, and as a schoolboy took a Saturday job in a draper’s shop (selling clothes). The shop’s owner was impressed by Robert’s work ethic, especially when he found Robert tidying stock on a Saturday. He gave the boy a full-time post when Robert left school. From there, Robert rose through the ranks to become a buyer and manager. The owner left £200 in his will to Robert, but the money came with a catch – Robert had to set himself up in business. In 1926 he took over a draper’s shop in Mostyn Street, Llandudno, and transformed it into a thriving department store known as Clare’s Modern Store. Initially it concentrated on clothes and hats but later diversified into china, kitchenware, carpets and even furniture. 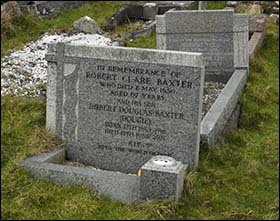 After Robert’s death, aged 67, in May 1950, the business was continued by his son Robert Douglas Baxter, who was buried here in 2001. Today the shop is in different ownership but retains the Clare’s name and many of the architectural features of Robert Clare Baxter’s era. You can read more about the shop and see photos of it here.